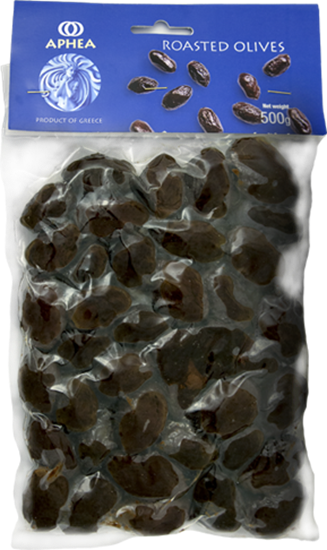 The Roasted olives, savory or wrinkled, are fully ripe olives ripen and shrivel on the tree. The nets are placed under the trees and the olives fall when fully ripe. Their natural form is completely wrinkled, full of folds. They are the only olives that can be eaten directly from the tree but are kept dry for commercial reasons. One variety of olives is called Throumpes. Most Throumpes olives come from the Greek island of Thassos or Amfissa (Central Greece). Roasted Olives have a very special taste. The olives are harvested by hand, salted and then baked. By following this process, this unique olive is generated.